From Shocking Pink to lava rocks, this Schiaparelli jewelry collection features pieces from the 1940s-1950s. You will find bracelets, earrings, brooches and necklaces in extraordinary designs and distinctive materials. Elsa Schiaparelli, along with her arch-rival Coco Chanel, was responsible for the acceptance and success of costume jewelry in the 1920s. Both women designed specific pieces to adorn their haute couture. Schiaparelli believed that costume jewelry, in addition to being an essential part of fashion design, was an art form in its own right. She collaborated with many jewelry designers as well as with Surrealist artists who were her friends. Read more about Elsa Schiaparelli. This gold-tone late-1940s brooch by Elsa Schiaparelli is "designed as [a] dancing openwork leaf" (Becker) and set with emerald, ruby, sapphire and amber art-glass cabochons in dog-tooth prongs. The outline of the leaf and stem are textured. This versatile and elegant brooch closes with a roll-over safety clasp. I think this jewel was meant to be worn with the leaf pointing down, as shown in the first photo, but the third photo shows the leaf pointing up – you decide which you prefer! Three trios of textured leaves are layered on this 1950s brooch by Elsa Schiaparelli. The matching ear clips each have a single leaf. The finish is a warm (but not bright) gold-tone. Although I have a bracelet with the same design, that piece has a silver-tone finish. Scroll down to see the bracelet. 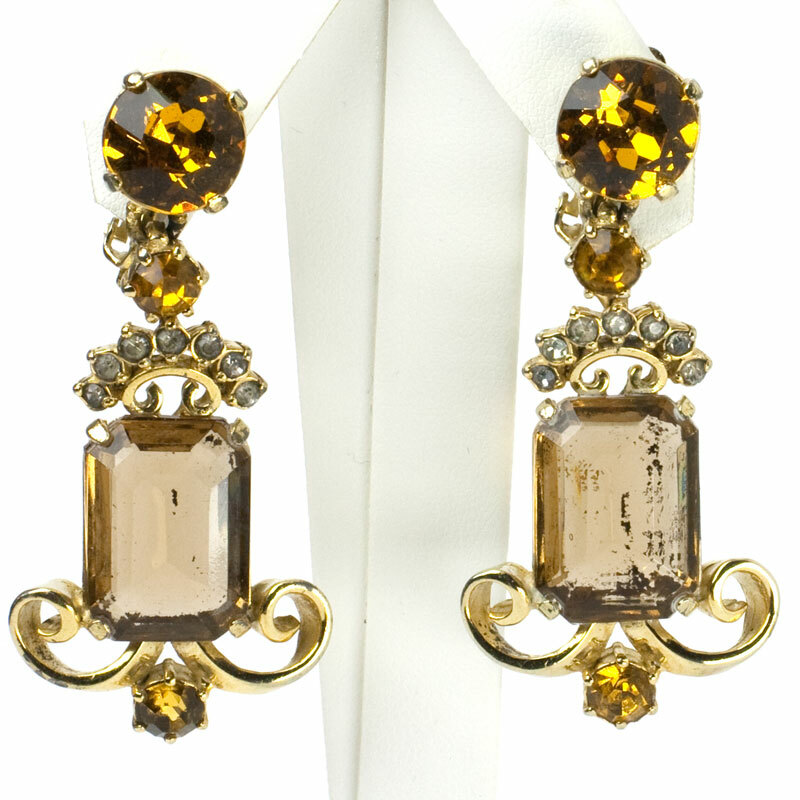 Three faceted, shield-cut topaz-glass stones – two golden and one brown – with citrine accents form these ear clips by Elsa Schiaparelli. The exotic three-sided shape of the large stones enhances the three-leaf clover design in gold-tone metal. These details and the elaborate construction of the earring backs exemplify this maker's ingenuity and quality. This color combination – which is perfect for those who look best in warm colors – can be found in other Schiaparelli pieces. You can see the utility patent for the earring clasp here, shown below the names Frederick A. Ballou, Jr. & Rogers T. Stafford. This stunning three-dimensional 1950s brooch by Elsa Schiaparelli features clusters of onyx crystal beads atop clear aurora borealis (AB) and onyx rhinestones. The AB navettes reflect spectacular colors and give this piece so much life, which is hard to capture in photos. The setting is silver-tone metal with a roll-over safety clasp. If red is your color, scroll down to see the same brooch in fiery red. 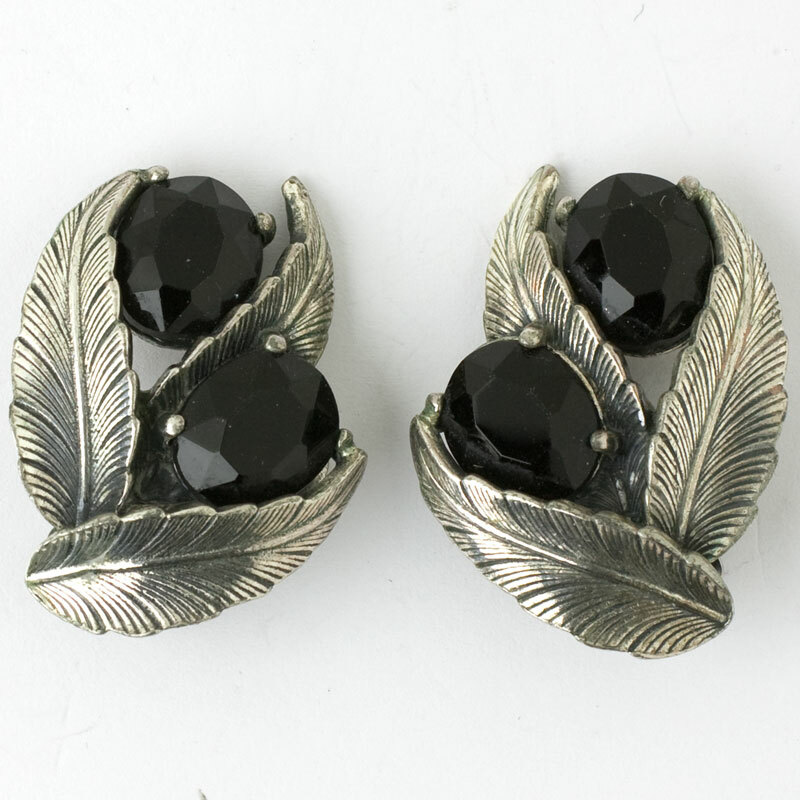 Each of these classic 1950s ear clips by Elsa Schiaparelli features two faceted, oval onyx-glass stones nestled in a trio of curled, textured, silver-tone leaves. Designed with one of her favorite motifs (leaves), this pair is so well-made that even the backs are textured. 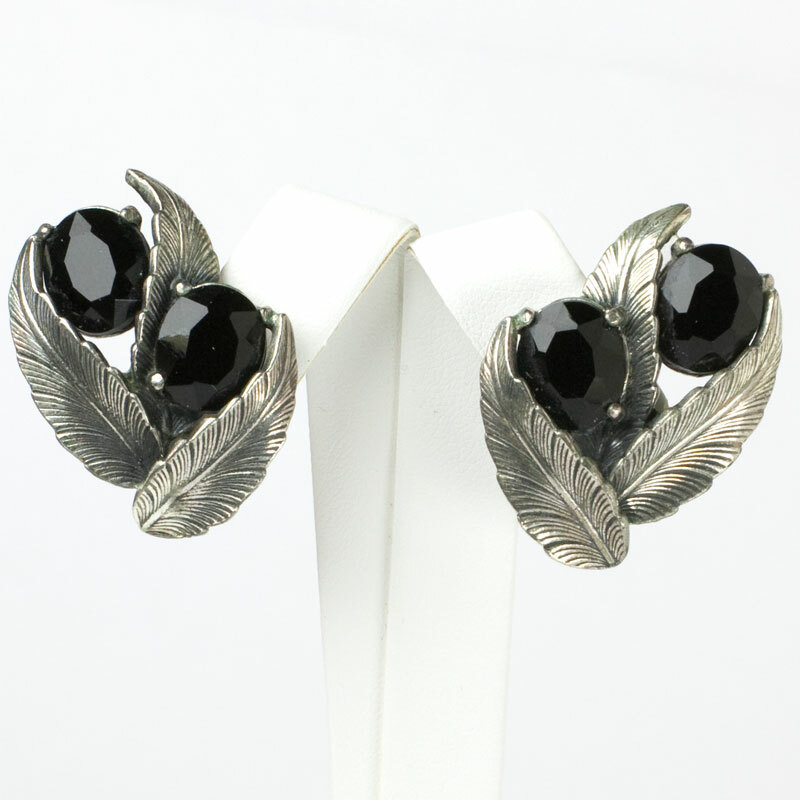 As was the custom in the 1950s, the earrings face each other, so they will frame your face to perfection. The matching necklace is available – scroll down to see it. Each section of this Schiaparelli necklace from the 1950s features a pair of curled, textured, silver-tone leaves revealing a faceted, oval onyx-glass stone. 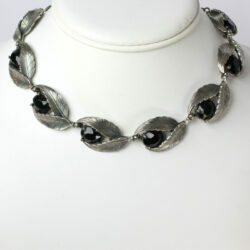 Leaves were one of her favorite motifs, and this piece aptly illustrates how well she designed them. Even the backs are textured. This necklace, with its detailed, decorative chain, closes with an adjustable-hook and ornamental tail. A graceful and stunning piece by an outstanding maker! 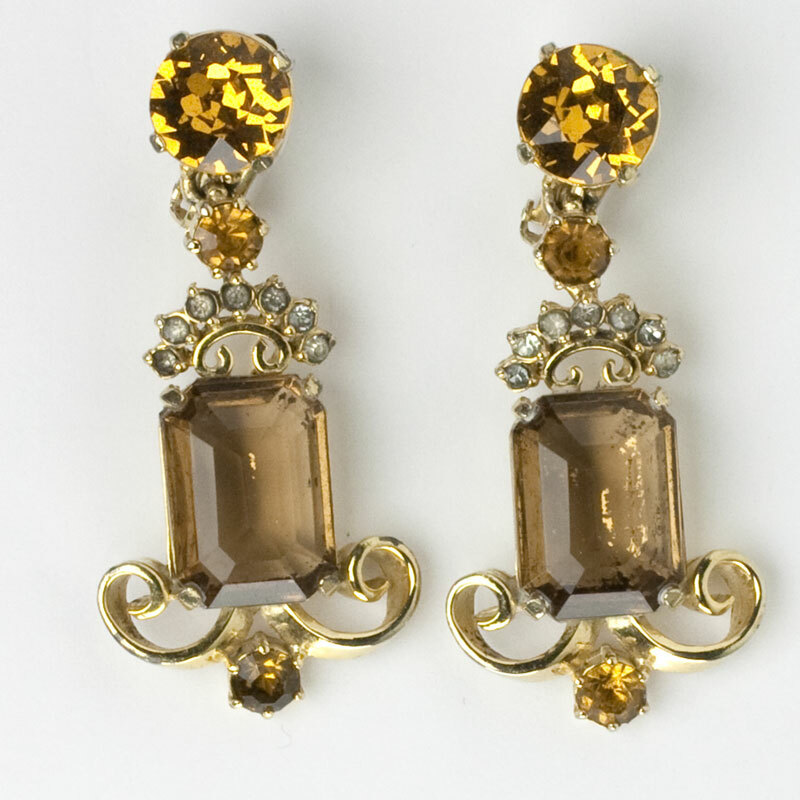 The matching earrings are also available — scroll down to see them. This Schiaparelli lava rock bracelet combines the designer’s signature stones with her signature color. 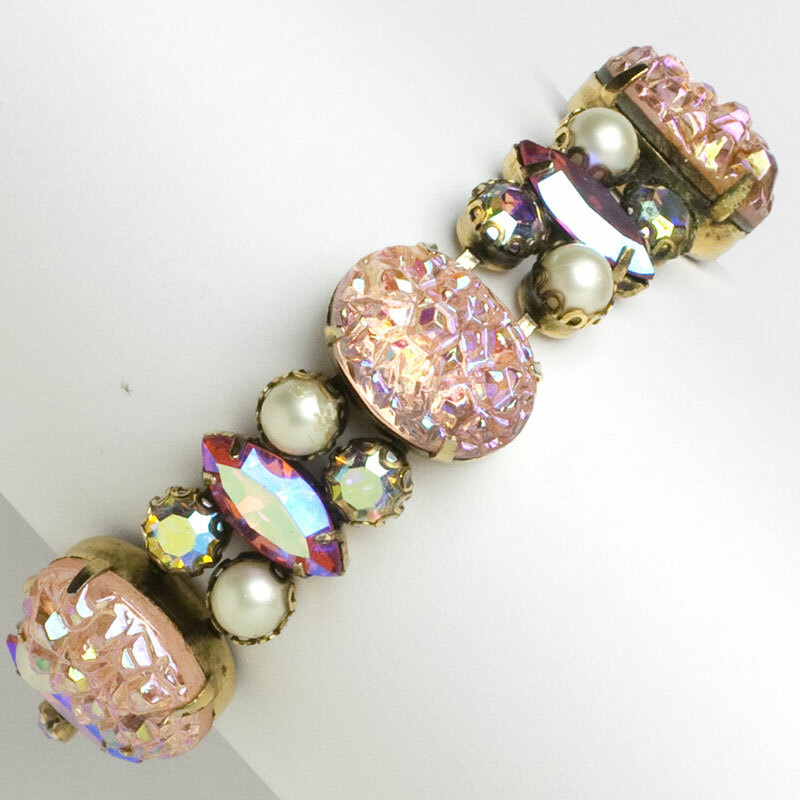 The five pale-pink lava rocks are connected with Shocking Pink marquis-shaped glass stones, faux pearls, and round aurora borealis (AB) rhinestones. Two Shocking Pink stones adorn the concealed clasp. 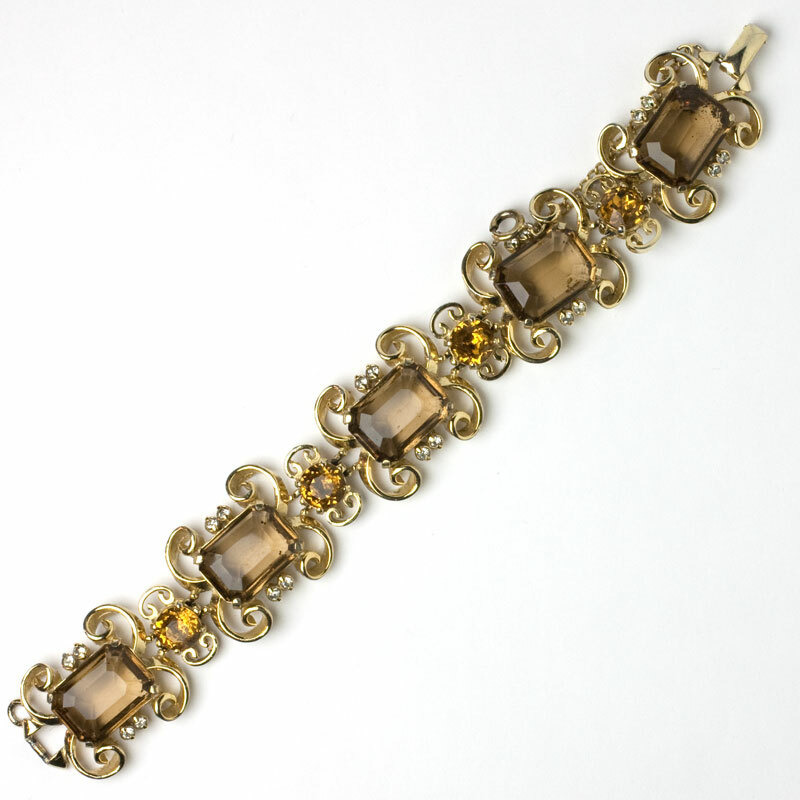 This 1950s bracelet, which is mounted in gold-tone metal, also has safety chain. Although some pearls show mild wear, this bracelet continues to dazzle. A classic Schiaparelli piece! This stunning 1950s three-dimensional brooch by Elsa Schiaparelli features clusters of ruby-crystal beads atop ruby and aurora borealis (AB) rhinestones. In person, this piece looks like a display of fireworks – the iridescence of the AB navettes is hard to capture in photos. The setting is silver-tone metal with a roll-over safety clasp. Even the back of the brooch is textured! With this statement piece, all you need to complete your jewelry accessories is a pair of faux or genuine diamond stud earrings. If black and white is more to your taste, scroll down to see the same design in that combination. This Schiaparelli brooch is one of those pieces that should come with instructions for how to wear it. So I’m showing this exquisite 1950s creation in three different positions, hoping that at least one of them will appeal to you. Or you may think of a better one! This incredible brooch has two large sapphire-blue lava rocks in dog-tooth prongs embellished with sapphires and amethysts. The complementary glass stones are round and navette in shape. The lava rocks have an incredible iridescence (like a fire within), and the color combination is delicious. The setting is silver-tone metal with a roll-over safety clasp. This gorgeous statement piece is Schiaparelli at her best! This silver leaf bracelet by Elsa Schiaparelli is a true statement piece, at 1 3/4" wide. Each of the five panels has a trio of layered and textured leaves. 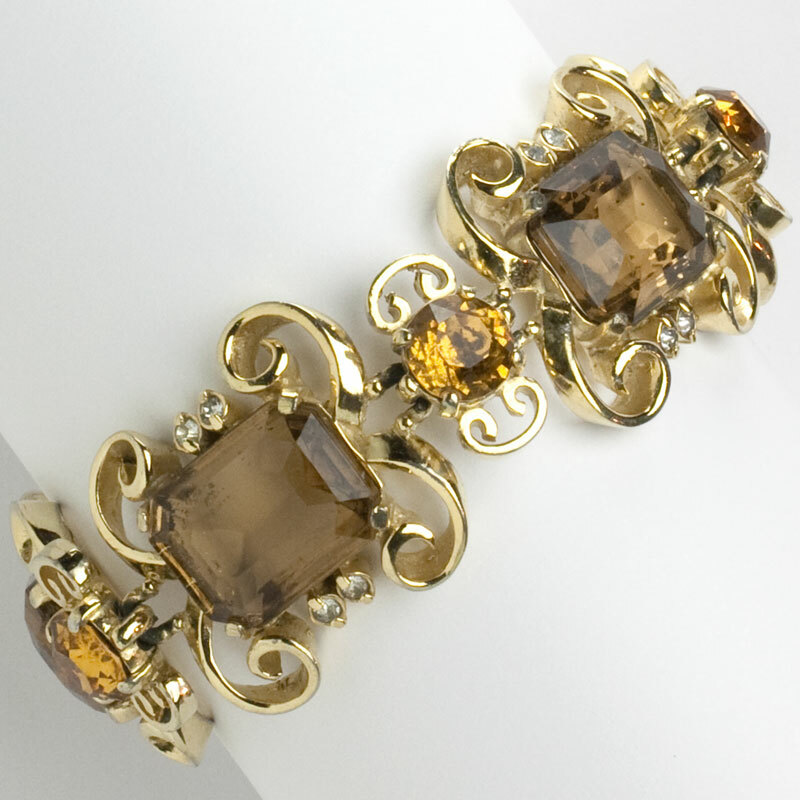 Here she uses one of her favorite motifs to create a type of jewelry she favored – an unusual and bold bracelet. 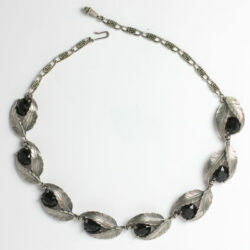 This piece has a fold-over clasp and safety chain. If you like this design, scroll down to see a brooch and earrings set by the same maker but with a different finish.